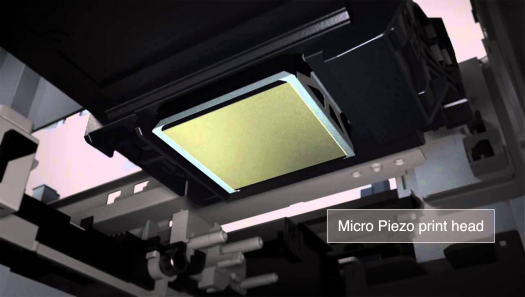 All of APEX UV printers are equipped with “Micro Piezo Technology” printheads. Micro Piezo printheads eject droplets of ink via mechanical pressure. This mechanical pressure is created when piezoelectric elements in the printheads contract in response to an applied voltage. 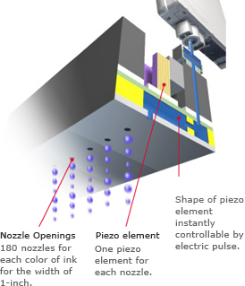 The first is that Micro Piezo printing systems do not use heat to eject the ink droplets. The second is that they precisely control the volume of ink contained in each ink droplet. Unlike thermal inkjet systems, Micro Piezo systems do not use heat, which can alter the ink's material properties. Micro Piezo printheads are thus compatible with a far wider variety of inks, including dye inks, pigment inks, eco-solvents, UV-cured ink, and a variety of other materials. We are exploiting this advantage by expanding our lineup of printers for a wide range of applications, such as the printing of posters, billboards and signs, textiles, labels, and much, much more. Micro Piezo printheads are extraordinarily durable because they are not subjected to heat-induced functional deterioration. They are fully equipped to withstand use even in grueling, high-volume office printing applications and applications in industries where usage conditions are harsh. 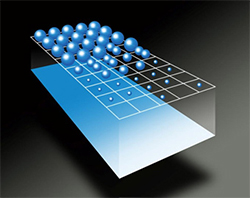 VSDT (variable size dot technology) is used to precisely control the volume of ink contained in individual ejected droplets. Sharp, rich, virtually grain-free images are rendered by depositing spherical ink droplets in a range of sizes, the smallest being as little as 1.5 pico-liters, or one one-trillionth of a liter, in precisely the amounts and locations needed. In addition, meniscus control prevents ink left in the ink chambers in the printhead from affecting the shape of ink droplets that are to be ejected, ensuring that ejected droplets are always perfectly spherical and land with high positional accuracy. 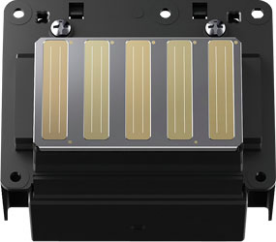 VSDT, which controls the size of up to 50,000 ink droplets that are ejected every second, also contributes to fast printing speeds.